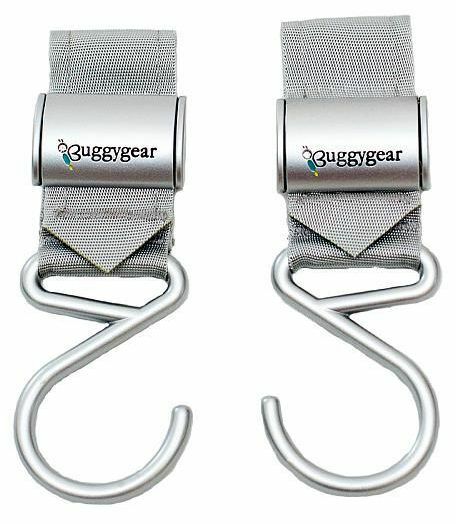 Buggygear Premium Boutique Buggy Hooks (Set of 2) - Silver/Platinum. First and only premium stroller hooks with no Velcro or plastic. This pair of handy buggy hooks hook to each side of your stroller to hang individual items or one large stroller bag. The high end metal clasp with the interwoven strong fibers latched securely to most crossbars. Rubber strap grips holds hook from sliding around. First and only premium stroller hooks with no Velcro or plastic. The perfect solution for towing bags while on the go.